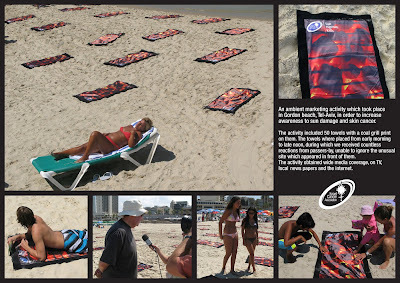 directdaily: Israel Cancer Association "Grill towels"
An ambient marketing activity which took place in Gordon beach, Tel Aviv, in order to increase awareness to sun damage and skin cancer. The activity included 50 towels with a coal grill print on them. The towels where placed from early morning to late noon, during which we received countless reactions from passers-by, unable to ingnore the unusual site which appeared in front of them. The activity obtained wide media coverage, on TV, local news papers and the internet.